After many years of gestation my latest book is available for purchase as an early-access pre-release. Called Becoming a Better Programmer, it is a handbook for people who are about code. This early access edition already contains 14 chapters, and there are many more coming. There is a free "sample" version available so you get a taster of what you'll be purchasing. Get it from gum.co/becomingbetter. Join the book discussion here: moot.it/becomingbetter. It would genuinely love to hear any feedback, praise or criticism that will help improve the book. Suggestions for topics to cover are also of real interest. 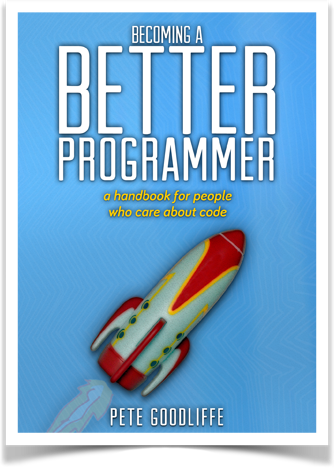 My honest hope is that this book does just what it says on the cover: helps many developers improve their skills, to become more productive programmers. We know what this does, right? Eric Lippert tells us about mutating *readonly* structs: http://blogs.msdn.com/b/ericlippert/archive/2008/05/14/mutating-readonly-structs.aspx but even non-readonly structs can get us in a mess. I'll be speaking at this year's excellent ACCU Conference 2014. This year my talk is: Words in Code, a technical (and not so technical) appraisal of how developers write. It's a practical distillation of my fourteen years as a magazine columnist, multiple book projects, and more. Come and enjoy it on Thursday 10th April at 10am. The conference's earlybird booking deadline is February the 14th. ACCU is one of the highlights of my developer year - it's a truly excellent conference. If you've not considered going, check it out!